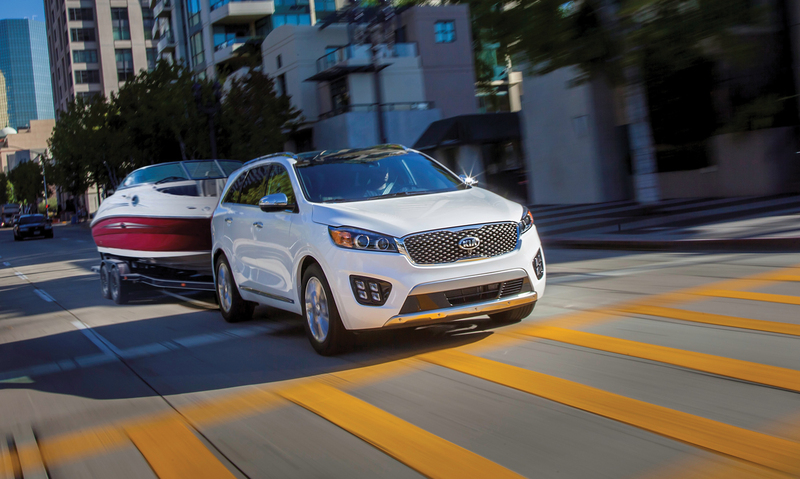 With pricing starting at just under $25,000 and the optional three rows of seating, it’s a bargain, but when you add in all of the standard equipment, the Sorento becomes a steal-of-a-deal. The 2016 Kia Sorento surprises most folks with its outstanding looks. Its narrow headlights integrated into its aggressively-styled overall design give the Sorento a brawnier stance. 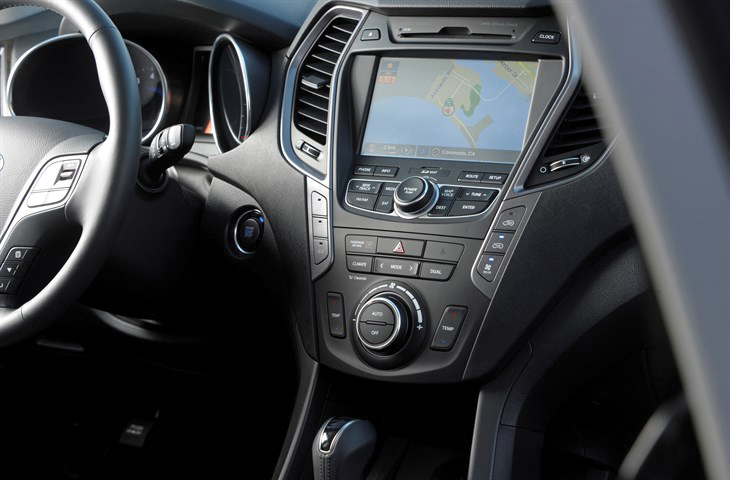 The seating system of the new Sorento is more accommodating in 2016. Second- and third-row passengers will enjoy a 0.5-inch increase in rear passenger space for both rows and a roomier, flattened second-row center floor. Access to third-row seating is improved with 1.5 inches of additional boarding space. The spirited front or all-wheel drive experience is brought to life with a choice of three engines, including a 2.4-liter inline-4, a 3.3-liter V6 and a new turbocharged 2.0-liter inline-4. The V-6 delivers 290-horsepower and gets 17 MPG-city and 23-highway. All three engines are connected to a six-speed automatic gearbox. The new suspension system delivers more responsive steering and a better ride too. Our full-time all-wheel drive system and 19-inch alloy wheels not only look good but improve overall comfort and driver confidence. It seems every automaker is producing a mid/full-sized crossover SUV these days, and for good reason, it’s the biggest selling category. So it’s no surprise that Hyundai has one too, called the Santa Fe – not to be confused with the smaller Santa Fe Sport. The Santa Fe is over six-feet wide and sixteen feet long so it might be a good idea to first measure your garage before bringing it home. Enhancements to the electric power steering system and suspension last year further sharpened the Santa Fe’s ride and handling. Hyundai’s Driver Selectable Steering Mode received an updated 32-bit microprocessor and tuning for a firmer steering feel. 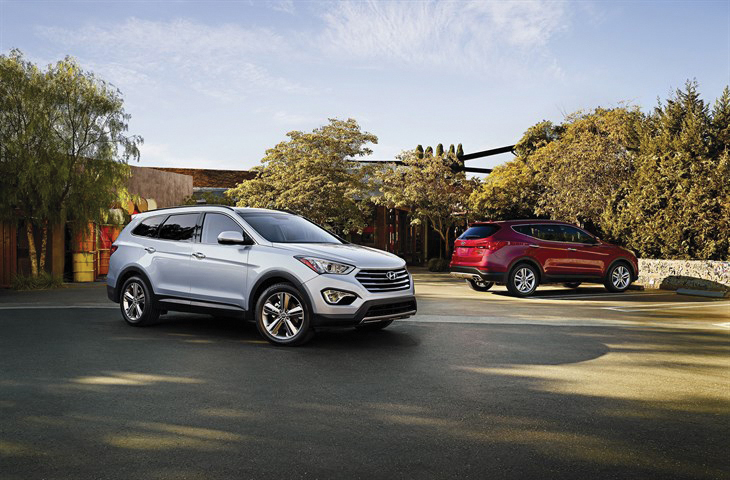 The Santa Fe continues to offer front or all-wheel drive and three rows of seating. Hyundai’s 3.3-liter, 280-horsepower V-6 is connected to a 9-speed automatic transmission in the top LTD trim level. Standard features include remote keyless entry with alarm, body color heated exterior power mirrors with driver’s blind spot mirror, LED headlight accents, steering wheel mounted audio and cruise control and Bluetooth hands-free phone system. You’ll love the interior appointments and quality too.